The Edward Segal Inc. Model SF2 is a fully automatic machine tooled for industry snap fastener components. This machine is offered for customers looking for an affordable, reliable solution for snap fastener applications. 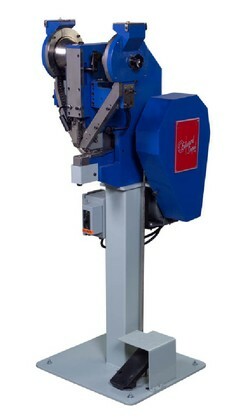 The Model SF2 is a flywheel powered machine and features rotary hoppers, a target light for locating the snap position on the material, and a mechanical clutch with a non-repeat mechanism, to ensure long-term safe operation.